JCR Air-sieve Classifiers – JK Machinery s.r.o. Machine is driven by pair of vibromotors. 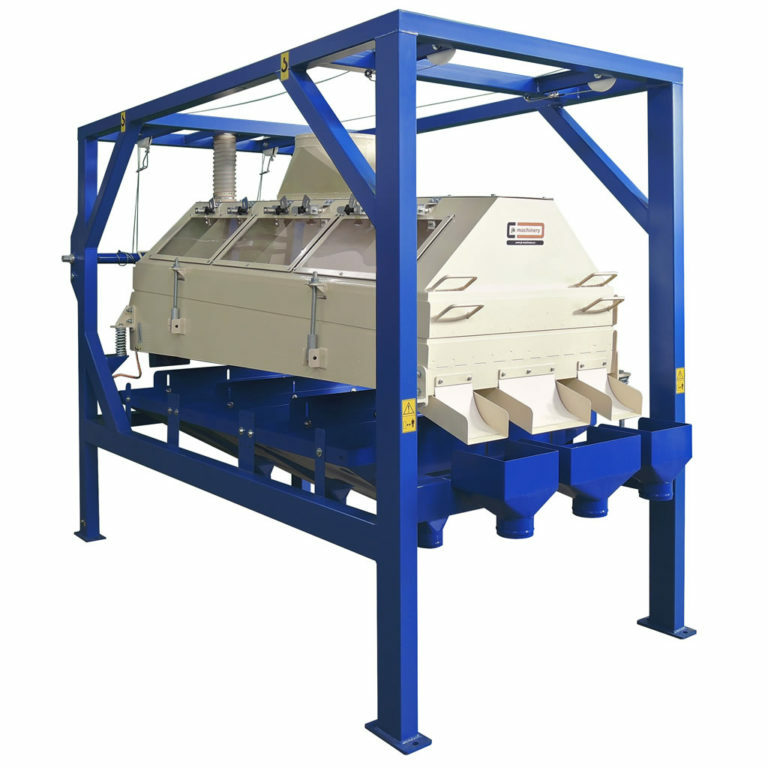 Machine in basic configuration has sieve box equipped with 2 sieve decks, each deck has 3 sieves. 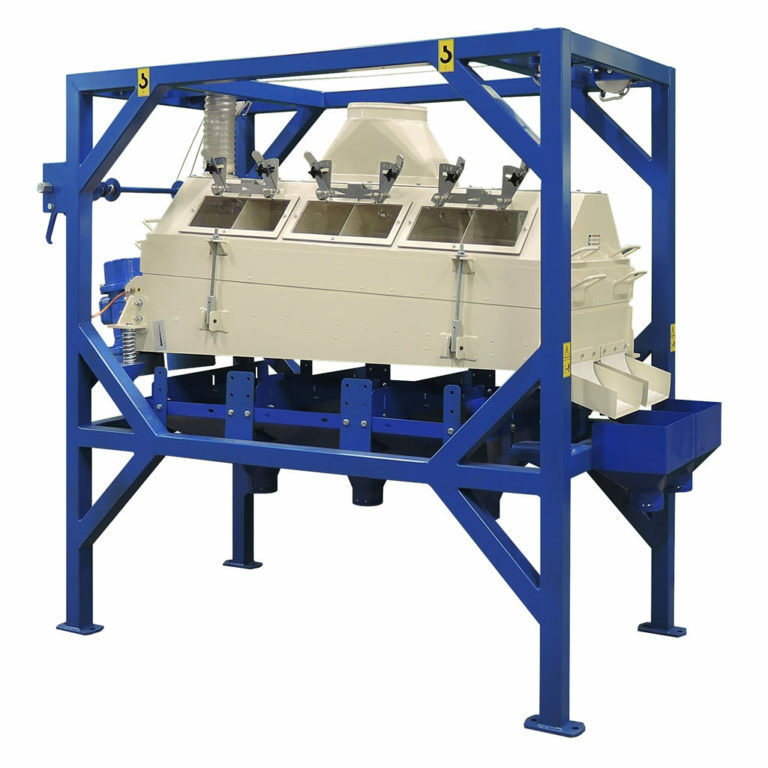 Such arrangement of sieves enables sorting of product to three sieves throughs and two oversize flows. Sieves are cleaned by flexible balls. Quantity of air coming through each sieve is finely adjustable. Ample selection of sieves acc. to sorted product as well as precise control of coming through air ensures perfect sorting acc. to size and partially acc. to specific weight of particles. The final product is usually cleaned to purity above 99,5 %. Inclination of sieve box (product flow speed) is adjustable. Thanks to a special lifting device, sieves are easily replaceable. Machine is aspirated by radial fan (JVR). Aspirated air should be cleaned by cyclone separator or by filter. Usability of each fraction depends on quality of material to be cleaned and on sieves selection and amount of air flow. Crops processed on JCR Air-sieve Classifier should be properly precleaned to achieve as good cleaning results as possible. For cleaning of small seeds and sowing seed it is recommended to complete JCR Classifier with JGT Gravity Table. Sorting and cleaning of technical materials, such as various plastics, crushed rubber, milled presswork, etc. Capacity parameters of the machines are informative, vary acc. to kind, quality, humidity and inpurities content of processed product.